The temperatures here in Colorado are dropping, and many parts of the state have already started accumulating snow. If you have a custom outdoor kitchen, then you may be thinking that the season for enjoying your outdoor space has passed, but don’t let the cold chase you inside! Colorado residents know that there are still plenty of warm days left in the calendar year, and the team here at Artisan Outdoor Kitchens knows that there are plenty of solutions for making your outdoor living space more comfortable even as it cools off. Read on for ideas on how to heat your outdoor kitchen or patio, and contact Artisan Outdoor Kitchens today to discuss your custom design! 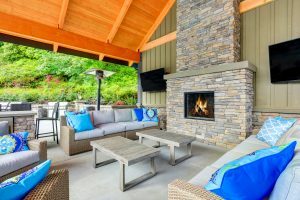 Spend more time in your custom outdoor living space even as temperatures dip with electric heaters! There are more than a few options to choose from, and chances are you’ve already seen a few possibilities at your favorite downtown restaurant. 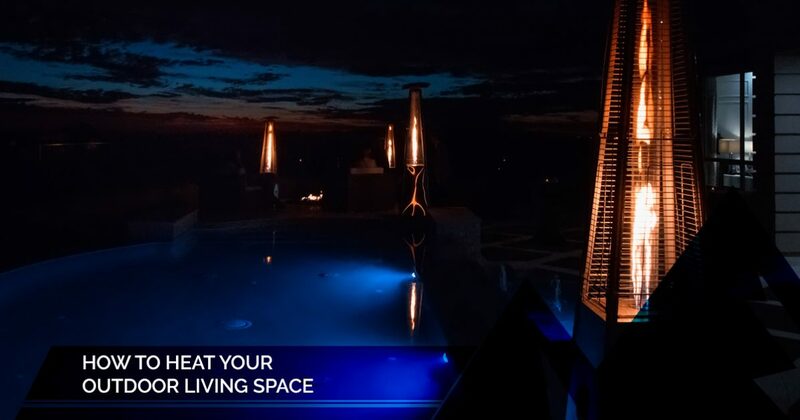 Heat lamps are popular in all-season areas like Colorado for those who want to spend as much time outside as they can, and they can be a simple addition to your patio or outdoor kitchen. From style and design to efficiency and fuel type, the possibilities are nearly endless. You’re sure to find something to meet your needs if this is an option that interests you. For a more rustic feel, incorporate a fire pit into your outdoor living space! This is another great option if you have already finished your outdoor kitchen design, or if you’re looking for ways to extend your patio use throughout the year. Fire pits are portable, easy to use, budget-friendly, and customizable. You can enjoy everything you love about campfires right in your backyard, and entertain friends even as fall leads into winter. If you are still working with Artisan Outdoor Kitchens on your outdoor kitchen design, then it’s not too late to incorporate an option for heating your space! A fireplace can be a stunning addition and a fun centerpiece to your outdoor living space. Enjoy the warmth and and ambience, and make it a key part of your outdoor kitchen for delicious creations like s’mores! The Artisan Outdoor Kitchens team is dedicated to creating a space that you’ll love, and we would happy to work with you to find a design you can’t wait to use. Are you looking for a simple way to stay warm in your outdoor living space? Add blankets! It’s an affordable and low-maintenance solution, and you can choose from an endless variety to design your space. Use this opportunity to add interesting colors and textures to your seating area, and encourage your guests to snuggle up! You love spending time outdoors, and with the right solutions, you don’t have to be stuck inside when the temperatures cool off. There are plenty of heating options you can customize to your space and design preferences. Heat lamps and fire pits are perfect for adding warmth to an existing patio or outdoor kitchen. If you are still in the design stage, then ask your Artisan Outdoor Kitchen team about adding an outdoor fireplace! For those who want to keep it simple, you can supplement your seating area with a few cozy blankets and invite plenty of friends over to share the warmth! Whatever you decide, we hope you choose Artisan Outdoor Kitchens to help you design your outdoor living space. We are dedicated to creating a custom outdoor kitchen that meets your needs and exceeds your expectations. Explore our site for more outdoor kitchen ideas and inspiration and contact us today to get started!